Burnley boss Sean Dyche is seeking ‘closure’ on the debacle surrounding Danny Ings as the club await the decision of a tribunal over a compensation package for the striker. The 23-year-old traded Turf Moor for Anfield in the summer, joining Liverpool on a free transfer after his contract with the Clarets expired. With the two clubs failing to reach an agreement on a valuation for the England international, and with Ings being under 24, an ad hoc group known as The Professional Football Compensation Committee (PFCC) will conclude the debate. Reds team-mate Daniel Sturridge set the tribunal record at £6.5m when joining Chelsea from Manchester City in 2009, though Ings’ valuation could exceed that figure once a decision is finally made. 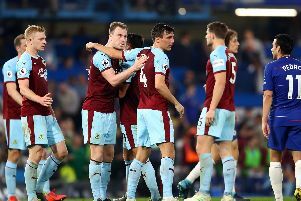 “The process is ongoing,” said Dyche, who feels the delay has challenged the club in the transfer market. “It’s not helpful. Like any business, ideally, you have got funds in and then you look and say ‘what can we put out’ and that is a grey area with no knowledge of where it will end up. “So that is a challenge. But they are the rules, whether we agree, like them or dis-like them, there are the rules. The PFCC will likely take in to account a number of contributing factors; the status of the two clubs (transferor and transferee), the age of the player, the terms of which the player was engaged by the transferor, the amount of any fee paid upon registration, the length of time the player was at the club, the terms of new contracts offered and the player’s record both domestically and internationally. “It certainly helps to know where you’re at. We’re all of the thinking it will be a considerable deal,” said Dyche. “We don’t know how considerable, but we’re certainly thinking more than a couple of shekels. He added: “If you think back to early season they had a tough start. When Danny got in they turned a corner. Jamie Carragher is coming out and saying ‘Danny’s been the difference’ etc.